"The Abbey has a longer history… Not all good." Warner Bros has debuted the eerie first teaser trailer for the horror movie The Nun, directed by English filmmaker Corin Hardy (The Hallow) and produced by horror maestro James Wan. This film is a spin-off from James Wan's The Conjuring "universe", similar to Annabelle but something else entirely new. The Nun is about a priest named Father Burke who is sent to Romania to investigate the mysterious death of a nun. The cast includes Demian Bichir as Father Burke, Taissa Farmiga as Sister Irene, Jonas Bloquet, Charlotte Hope, Ingrid Bisu, with Bonnie Aarons playing the evil "The Nun" character. This trailer opens with that bold title card about watching to the end. Who wouldn't finish watching a 90-second teaser? It's not the biggest scare ever, but it's fun. Give it a look. When a young nun at a cloistered abbey in Romania takes her own life, a priest with a haunted past and a novitiate on the threshold of her final vows are sent by the Vatican to investigate. Together they uncover the order’s unholy secret. Risking not only their lives but their faith and their very souls, they confront a malevolent force in the form of the same demonic nun that first terrorized audiences in “The Conjuring 2,” as the abbey becomes a horrific battleground between the living and the damned. 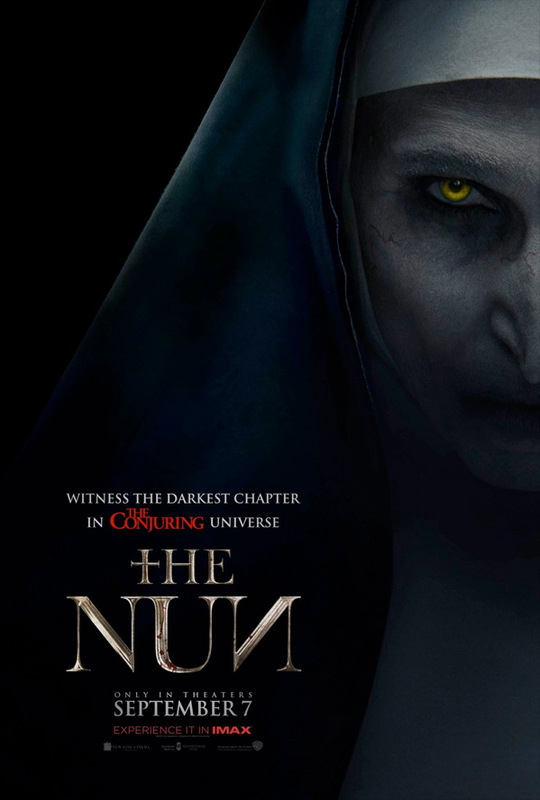 The Nun is directed by English filmmaker Corin Hardy, his second film after The Hallow and numerous shorts previously. The screenplay is written by Gary Dauberman, from a story by James Wan and Gary Dauberman. Warner Bros will release Hardy's The Nun in theaters everywhere starting September 7th in the fall. First impression?